You've likely used referrals and you know how effective they can be. In fact, it might be what makes your business work. Unless you have an active referral strategy, though, you could be missing out on new customers. Here's a quick process to ensure that you get the most out of your referral strategy. You're looking for those who truly appreciate the time and effort your put into a job. They understand that what you do requires skill and attention to detail. They probably thank you for doing such a great job. Also, think of your favorite customers, the ones you enjoy working with. Referrals often bring in similar business, so approach the kind of people that you want more of. If a customer always wants a rush job for a standard price, or if they complain about minor details that you have no control over, then be wary of approaching them for a referral. The potential clients they will likely refer may have the same attitude or behaviors. You know the power of referrals, and so do your fellow contractors. Not everyone has that experience, though, so you will want to explain to your happy customers how they can help you reach more happy customers. If you happen to know what kind of work they do, you can just mention how referrals are probably important to them as well. If not, just let them know that word of mouth plays an important role in your marketing because you place pride on a job well done. When you ask for a referral, you want to do it in a way that is most likely to lead to results. First, you want to avoid yes or no questions. "Do you know anyone who needs [our service]?" isn't a great way to lead to a referral because yes or no questions don't extend the conversation. Instead, ask something like, "Who do you know who [understands value]/[appreciates quality]/[has high standards] like you do?" This shows that you value what they bring to the table and asks them to think of people who have the qualities you're looking for in a customer. You can either ask for that person's contact information or give out your card and ask your customer to refer you to them. When a customer refers a potential client to you, be sure to let your current customer know the result. Even if you don't end up working with that referral, you want your current customer to know how much you appreciate their effort. If you end up with a new client, then you'll definitely want to thank them. Also, be sure to do a great job with that referral because your customer's reputation is now involved. Referrals are a gift that keeps on giving. After developing a good strategy, you can continue to use it with new and existing customers, growing your base and providing even more opportunities for new business. 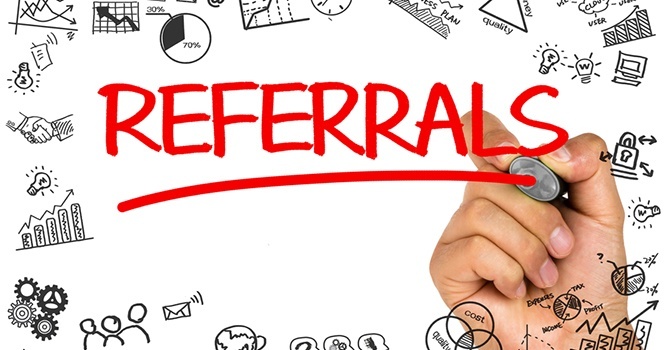 If you haven't been actively asking for referrals, you should start today. The first one will be a bit uncomfortable, but it will become second nature soon enough…especially once you start to see new clients coming in.